Adore the mythical aroma of Aloe Vera in these Stamford Black Unicorn's Grace incense sticks, its magical presence is sure to transport you to a serene and tranquil land. 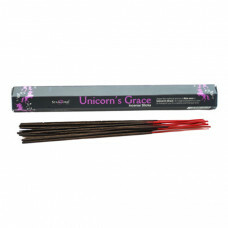 Simply light the tip of your Stamford Black Unicorn’s Grace Incense Stick and wait for it to glow. Then blow out the flame and place in an incense holder for beautiful fragrance throughout your home.